Wichita, KS-December 16, 2013—The Wichita Aero Club announced today that it has received a $10,000 grant to its Scholarship Fund from BBA Aviation’s Charitable Giving Program. BBA Aviation is the parent company of Signature Flight Support, which operates a Fixed Base Operation (FBO) at Wichita Midcontinent Airport and at 64 other locations across the United States. Signature Flight Support is the world’s largest network of FBOs, with over 100 locations providing consistent, exceptional service. Bryan Orr, Signature’s Area Director, and Brian Youngers, Station Manager for the Wichita facility, presented a check to the Aero Club at its annual ON-AIR SUMMIT luncheon on December 16 at the Doubletree by Hilton Wichita Airport. “This is an extremely generous and timely gift from BBA,” said Wichita Aero Club President Dave Franson. “We are in the process of expanding our scholarship program with an eye to adding more scholarships and perhaps increasing the value of each one so it comes at a fortuitous time and strengthens the financial base of our scholarship program. 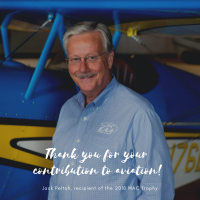 We can’t thank BBA and Signature enough for this significant display of generosity.” “Signature Flight Support and BBA Aviation are committed to supporting the communities in which we operate,” noted Mr. Orr, who is also a member of the Wichita Aero Club board of directors. “In 2010, BBA Aviation launched its Charitable Giving Program as a Group-wide initiative to complement the many existing charitable giving and community involvement at BBA Aviation’s operating companies. It’s our way of bringing our mission and values to life by making a real and sustainable difference to the industries in which we operate and a positive and lasting influence on the communities in which we live and work. It’s a key component of BBA Aviation’s commitment to Corporate Social Responsibility.” The $10,000 gift will be added to the Wichita Aero Club scholarship fund which was established with the Wichita Community Foundation last year. It will help underwrite the club’s existing Edward W. Stimpson Scholarship and additional educational grants which will be added as the fund grows. The BBA gift is currently the largest received by the Wichita Aero Club for its educational initiatives, which are also supported by proceeds from the Club’s annual Trophy Gala and Wichita Aero Club Golf Classic.